Dr. Karm Virk is truly a man of the world. He was born in India, raised in Canada, and trained in the United States and Canada. A graduate of Logan Chiropractic College in St. Louis, Dr. Virk has served as President of the International Chiropractic Fraternity; was Chiropractic College Student Body President; was recognized, in 1996, as Vancouver College Athlete of the Year; and studied Kinesiology (Sports Medicine) at Simon Fraser University in British Columbia. Dr. Virk is also the founder of the Chiropractic Games, the largest international sporting event for health care students. Over 1,800 students compete each year in sports such as volleyball, basketball, soccer, and ice hockey. 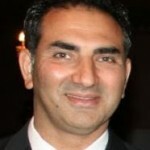 Dr. Virk practices chiropractic in Tukwila, Washington, at Southcenter Chiropractic. Dr. Virk, father of three lovely and healthy children, is a member of the Doctors Speakers Bureau, donating time to educational workshops and lectures dedicated to improving and maintaining good health in the community. At Southcenter Chiropractic he not only specializes in Auto and sports Injury care but takes a special interest in family care. Why did I become a chiropractor? It was more of a case of going into health care. While in college in Canada, I was working as an athletic trainer. I enjoyed this and so set my sights on either a career in physical therapy or sports medicine. There was one drawback in this career choice. I didn’t like drugs. My mother said, “How can you go into medicine if you are telling people not to take drugs?” I myself had not taken any drug for an illness since I was 11. Then, I was in an accident just before the tryouts to compete in the Canada Games. I was in so much pain that I missed the entire day of competition and it took hours for me to just get out of bed. I didn’t seem to be getting much better after the accident. So, out of desperation I went to my mom’s chiropractor. He adjusted me, and you know what? I felt the best I had felt in years. Then I noticed that my athletic performance began to improve. I was soon convinced of the efficacy of this type of treatment and switched my studies to chiropractic.